Playing golf with the 45th President of the United States offers a revealing character study of the man. Donald Trump's private clubs are where he feels most comfortable, and holding court with members and guests and employees is an important part of the ritual—in the pro shop, at the driving range and especially on the 1st tee, where Trump traditionally announces the teams for a friendly wager and will typically take the best player available for his partner. Some earnest person in the group will typically keep score, though the terms of the match are usually unstated and Trump's interest in the ebb and flow of the match is modest at best. Yet he somehow knows when his putt is meaningful, and he attempts those putts with a certain amount of fanfare. Trump always takes a cart and a caddie, whom he pays well. He insists on driving. Recent footage that showed him navigating his cart across a green at his club in Bedminster, N.J., generated horror in the golf press, but this is old news at Trump's clubs, where he has been known to drive onto tee boxes too. Trump will sometimes respond to a shot he duffed by simply playing a second ball and carrying on as if the first shot never happened. In the parlance of the game, Trump takes floating mulligans, usually more than one during a round. Because of them it is impossible to say what he has actually shot on any given day, according to 18 people who have teed it up with Trump over the last decade, including SI senior writer Michael Bamberger, who has done so nine times. In 2007, Trump called Bamberger to brag about a 68 he had shot at Bel-Air Country Club in Los Angeles. Trump's handicap index is officially 2.8, but he has posted only three scores since '14. Els, a South Florida resident who has known Trump for many years, estimates he is "an eight or a nine." For Trump to shoot 68 on a tough course like Bel-Air would require him to play nearly perfectly from tee to green while making a number of substantial putts. One of his playing partners that day confirmed that Trump played "good," but that he took all the usual liberties common among everyday golfers: mulligans, gimmes, improved lies, etc. There was no mention of the 68 in a subsequent story, and Bamberger heard about it from Trump. In a 2013 tweet aimed at entrepreneur Mark Cuban, Trump wrote, "Golf match? I've won 18 Club Championships including this weekend. @mcuban swings like a little girl with no power or talent. Mark's a loser." Trump has never made public a list of his club titles, and fact-checking calls to all of the Trump properties on this subject went universally un-returned. Winged Foot is the one non-Trump club at which the President is a member, and his name does not appear on any of the honor boards in the old clubhouse. Trump has often said that golf is a small part of his businesses but that it means more to him than any of the others. As he told SI years ago, "A lot of my friends are gardeners. I never understood it. Then I started building golf courses—it's gardening on a big scale." He clearly loves the game, and even at 71 is easily the best golfer who has ever lived in the White House. It is a long-standing trope that golf reveals a lot about a man's character. What, then, does President Trump's life in golf say about him? Donald Trump has always been attuned to the status markers of the ruling class. Private golf clubs were and remain a particular obsession of his. He could buy the gaudiest house in Palm Beach—and he did, Mar-A-Lago—but he would never be invited to join the nearby Seminole Golf Club, where Ben Hogan wintered every year to prepare for the Masters. (According to club lore, Trump's chances of admission vanished when he dined there with his then wife Marla Maples and she breast-fed their infant daughter, Tiffany, in view of the ladies who were lunching.) Trump may have reshaped skylines up and down the East Coast, but citadels such as Pine Valley and Shinnecock Hills remain beyond his grasp, their memberships prizing discretion and old money. If building skyscrapers is pure id, creating golf courses is a chance to play God by literally reshaping the Earth, and so Trump has created a series of monuments to himself, replete with man-made waterfalls. The perennial outsider now has nine eponymous private enclaves of his own, to go along with seven high-end public properties, on three continents. But building golf courses was never going to be enough. Trump pined for the validation that would come with important championships being conducted on his courses. These can only be bestowed by the tweedy ruling bodies, and so Trump campaigned for such tournaments with the same intensity he would later bring to chasing electoral votes. To woo the decision-makers, Trump lavished free memberships upon at least three golf officials as well as relentless attention that continues today; since being elected he has played golf with and had multiple phone conversations with Pete Bevacqua, the CEO of the PGA of America. There has been much to discuss: In May, Trump National Golf Club Washington, D.C., hosted the PGA Senior Championship, and in 2022 the PGA Championship will be played at Trump Bedminister, the so-called Summer White House in a tony hamlet in New Jersey, 45 miles from New York City and six miles from USGA headquarters. (The President is playing the long game with the PGA of America, hoping to land one of the sport's ultimate prizes, the Ryder Cup.) Last month Trump got a national championship when the USGA brought the U.S. Women's Open to Bedminister. Trump spent 2 1/2 days chewing the scenery at the tournament, his obvious good cheer undiminished by a smattering of protesters on nearby roadways and others standing peacefully beneath his aerie looming over the 16th tee. Trump tweeted eight times about the event, more than he has since taking office about opioid addiction, the international refugee crisis and climate change ... combined. Golf is never far from the President's mind, it seems. In perhaps the most cogent analysis of how he took the electoral college while losing the popular vote, he told The New York Times, "It's like, if you're a golfer, it's like match play versus stroke play." To illustrate his contention of widespread voting fraud, according to a story in the Times, Trump cited to a gathering of lawmakers that two-time Masters champ Bernhard Langer had been unable to vote at a polling place in Florida while several people "who did not look as if they should be allowed to vote" were permitted to cast provisional ballots. One complication with this spurious anecdote: Langer, a German national, is not a U.S. citizen and is not eligible to vote here. In feting Clemson's national football championship, Trump likened the team's iron will to Jack Nicklaus's and Arnold Palmer's. In a meeting with business leaders at the White House, Trump coaxed Jeff Immelt, the CEO of General Electric, into telling the story of having witnessed the President make a hole in one years earlier. While TV cameras rolled, Immelt said, "President Trump goes up to a par-3 on his course. He looks at the three of us and says, ‘You realize, of course, I'm the richest golfer in the world.' Then [he] gets a hole in one. So I have to say, I've seen the magic before." Here Trump interjected, "It's a crazy—no, I actually I said I was the best golfer of all the rich people, to be exact, and then I got a hole in one. So it was sort of cool." Ascending to the Presidency never seems to diminish any commander in chief's ardor for the game—Ike, Nixon, Clinton etc. On the campaign trail Trump mocked Barack Obama for playing golf too often, but since taking office Trump has spent some part of more than 20% of his days at a golf club. (Exactly how many rounds he's played is subject to conjecture because the White House refuses to confirm when the President tees it up, even on days when he's spotted with clubs in tow.) Trump has theoretically turned over day-to-day operations of his golf business to his son Eric—who was recently in Scotland to open the new King Robert the Bruce course, where he declared, regrettably, "We made Turnberry great again"—but there have been concerns about conflicts of interest. Four days after the election, the President-elect hectored British officials about a long-standing obsession: a wind farm off the coast of Aberdeen, Scotland, that he says spoils the views from Trump International Golf Links. In February, while Trump's so-called Muslim ban was front-page news, Eric and his brother Donald Jr. flew to the United Arab Emirates under Secret Service protection for the gala opening of Trump International Golf Club Dubai, a swank new course at the heart of a vast development where thousands of luxury homes offer the chance for Saudis and Iranians and other wealthy buyers to park their money. Another branded course, Trump World Golf Club Dubai, is being built down the road as part of AKOYA Oxygen, a 55-million-square-foot development; the course has been designed by Tiger Woods, who teed it up with the President-elect a month after the election. Trump has two large-scale golf projects in development in Indonesia, the largest Muslim country in the world. The Trump Lido course, outside Jakarta, is being designed by Els. On Bali, Mickelson is re-designing a course for what is being billed as a six-star resort. Trump's partner in both developments is Hary Tanoesoedibjo, a billionaire who was a vice presidential candidate in Indonesia on a failed ticket in 2014. Tanoesoedibjo was an invited guest at Trump's inauguration and later said his friend had inspired him to strongly consider running for Indonesia's presidency. An April '17 story by The Intercept detailed Tanoesoedibjo's alleged links to an ISIS-backed militia that is seeking to oust Indonesia's democratically elected president, Joko Widodo. Were Tanoesoedibjo to take the presidency in 2019, it would be un-precedented for a U.S. President to have such deep financial ties to another head of state. There is no doubting Trump's deep affection for the game of his Scottish mother's ancestors. (He has said that building Trump Scotland in woolly dunes on the eastern coast was a tribute to her—Mary MacLeod.) His first foray into golf, a half century ago, was not as a country-club kid but at a lively public course, Cobbs Creek, in West Philadelphia. He was introduced to the game by classmates while he was an undergraduate at Wharton from 1966 to '68. Trump said to GOLF.com, "My initial reaction to the game was that I loved the competition. But as you get older and wiser and richer, you realize it's not only about the competition, it's about the beauty of it, and that's what has kept me attracted me to the game more than anything: walking down all those beautiful fairways." He venerates the old-time greats. The clubhouses at his courses are full of pictures of Hogan, the most precise and least bombastic of all the great golfers. But Trump felt a particular kinship for Palmer, and before the King's passing last year, he often remarked, "What a man he is." When Trump named a villa at Doral for Palmer, Arnie was there to cut the ribbon. Ditto for Woods and for Gary Player. When Mickelson called Trump to praise the practice range at one of his courses, Trump saved the message for months. Trump has supporters in the LPGA because he has treated the players with a similar deference. From 2001 through '08 the tour held its season-ending event at the Trump course in West Palm Beach. (In '06 it became the first LPGA tournament to offer a million dollars to the winner.) Trump rolled out the red carpet for golfers who were accustomed to being treated with little fanfare. Throughout the tournament he relentlessly schmoozed the players, spreading goodwill and befriending two of the most prominent women on tour, Natalie Gulbis and Cristie Kerr. (Trump has offered advice on business matters to both and, in the case of Gulbis, counsel on her love life; after her romance with Ben Roethlisberger ended and she said publicly that he was the one who broke things off, Trump told Gulbis, "I never want to read that again. From now on I want to read that you dumped him.") On election night, when many athletes took to social media to express their misgivings about the result, LPGA pros were notable in their enthusiasm for the Trump victory. Suzann Pettersen's tweet was representative: "Hats off for this man, @realDonaldTrump, Mr. president 🙂 congrats my friend! #thetrumpshowwillcontinue." And so while the U.S. Women's Open generated protests in the streets last month (sign on an overpass of I-78: women's rights are human rights) and hand-wringing in the press, the players were largely supportive of Trump. Those with misgivings about playing their most important tournament on a Trump course were too politic to say so publicly, preferring to grumble to reporters off the record. The USGA had awarded the Women's Open to Bedminster in May 2012; sources within the organization confirm that last year, after Trump ratcheted up his controversial campaign rhetoric, the organization had looked into changing the venue but decided the cost would have been too high, financially and politically, especially after Trump threatened a lawsuit. For Trump, hosting the Women's Open was a triumph, the culmination of more than a decade of intensive wooing. The Women's Open is rarely a money-maker for the host venue but he gladly signed on, knowing it is often a stepping-stone to what he covets most, hosting a U.S. Open at his crown jewel Trump Bedminster. "I might be an old man being wheeled around or even dead," Trump told SI in '11, "but it'll happen." The red 1986 Ford F-150 Flareside rumbles down Lamington Road in the town of Bedminster, past the intricate stone wall and the two black signs emblazoned with gold lettering—trump national golf club and private—that mark the entrance to the club where the President's daughter Ivanka was married in 2009 and where he wishes to someday be buried. Two American flags stick out of the hood of the pickup, and a pocket-sized blue Constitution sits on the driver's seat. An effigy of Trump rides in the truckbed, the dummy adorned with a foot-long Pinocchio nose, a Russian flag in its right hand, and a cardboard tombstone around its neck that reads rip 23 million people. As the horn of the truck ceased functioning years ago, the driver and organizer of the rally, Jim Girvan, resorts to leaning out the window and blowing a vuvuzela as he passes the golf club. It's a bleak, rainy Saturday in the middle of June, and there are eight cars in the cortege, carrying 12 adults and one six-month-old baby. "Rain or shine, few or many, we persist to resist," Girvan, 64, says, taking a puff of his e-cigarette. The so-called People's Motorcade has met every Saturday since the first weekend of March, gathering at 9 a.m. at Ten Eyck Park, about six miles from Trump Bedminster, where the group adorns their cars with signs. (Today's includes DUMP TRUMP, replete with a poop emoji sporting a blond coif.) The protestors then drive up and down Lamington Road, honking horns and waving signs. The weekend before, 150 cars, carrying 500 people, came out to the rally because Trump was at the club hosting a fundraiser for Tom MacArthur, a congressman instrumental in passing the House health-care bill. All of this hubbub is in jarring contrast to the atmosphere in an idyllic town that is seemingly frozen in time. There are 8,200 residents of Bedminster, including Woody Johnson, the owner of the New York Jets and Trump's choice for ambassador to the U.K., as well as former presidential candidate and publishing mogul Steve Forbes. Most of the residents live on expansive properties carved out of the former farmland. The town seal has a horse's head emblazoned in the center, and there are still 18 miles of dirt roads in Bedminster, preserved over the decades to allow residents to meander on horseback. One eccentric is known for tooling around town in a carriage drawn by eight horses. Though Trump doesn't like to publicly identify a favorite among his courses, Bedminster is special to him because of the acclaim it has received and its proximity to his home base of New York City. It's so special, in fact, that in 2014 Trump filed a petition with the state of New Jersey to build a 10-plot private family cemetery on a piece of land overlooking the 1st hole. During election season, Bedminster morphed into a kind of permanent campaign rally site. Trump posters and bumper stickers were plastered across the property, and an anti-Hillary shrine was built in a bar in the men's locker room. The club held a Ryder Cup–style competition in which the teams wore either red or black Make America Great Again hats. At most other golf courses in America the TV is tuned to Golf Channel, on mute, but throughout last summer and fall, the television in Trump Bedminster's shop was on Fox News, with the sound blaring. As President, Trump has already made four visits to the club. He has his own cottage adjacent to the pool; it was recently given a secure perimeter by the Secret Service, leading to the inevitable joke that it's the only wall Trump has successfully built. Chatting with some members before a recent round of golf, he explained his frequent appearances: "That White House is a real dump." (A White House spokesperson denies this occurred.) Trump is often at his most unguarded among the people who pay for their proximity to him. Last November, the President-elect hosted a cocktail reception and dinner at Bedminster on the same weekend that he was holding interviews at the club with candidates for his Cabinet. At the dinner, Trump addressed the members of the club by saying, "This is my real group. You are the special people. I see all of you. I recognize, like, 100% of you, just about." Then he issued an open invitation to drop in on his Cabinet interviews the next day. It's plain to see why a lobbyist would revel in rubbing elbows with the President, but at Bedminster there has been a backlash to the fanfare that now accompanies Trump's visits. One member says two dozen of his brethren have already resigned or put their memberships on hold for a year and that he expects a similar number to vote with their wallets next year. This is less of a political protest than a nod to the attendant hassles: When Trump is on the grounds all cars are searched upon entry; if he is in the clubhouse, all members must clear security before entering, even if it's a quick jaunt to the gents at the turn; and if Trump is in his cottage, kids in bathing suits are wanded before being allowed in the pool area. Divisions within the town of Bedminster were reflected in the election—Trump won by just 42 votes. (Mitt Romney took Bedminster by nearly 600 in 2012.) Trump has a mixed reputation as a steward in the community. He set aside 210 acres for a grassland habitat for birds, and it was planted with a grass seed mix called Donald Trump Golden Fescue. But in '11 the New Jersey Department of Environmental Protection cited the golf club for a number of violations, including waste-water pollution, destruction of wetlands and the illegal removal of a stand of mature trees. Before Trump's foray into politics, the biggest controversy around Trump Bedminster was the "farmland" tax break because of the eight resident goats—which the club claims cut the grass—and 113 acres of hay surrounding the course. The designation saves Trump Bedminster tens of thousands of dollars a year in taxes, although the club is still Bedminster's second highest taxpayer, behind AT&T, which has a complex in town. The blurred lines between his roles as President and club patriarch created headlines earlier this year when a brochure for Trump Bedminster's bridal planning service stated that: "If [Trump] is on-site for your big day, he will likely stop in & congratulate the happy couple. He may take some photos with you but we ask you and your guests to be respectful of his time & privacy." The brochure was changed after an outcry that the President was using his office for monetary gain, but a few weeks later Trump still popped into a wedding, and photos of him with the bride and groom lit up social media. Trump Bedminster is an important gathering spot for charities and community events because the town has no hotel or other banquet hall to host meetings. "They've never turned us down," mayor Steven Parker says of an annual swearing-in party for public officials held at the club. "They give us the charity rate. So politics aside, I think the average person in Bedminster would have a very positive view of the Trump Organization and probably Mr. Trump. The people that I've mostly dealt with have looked at it like, ‘The sitting President likes our town as much as we do. So I may not agree with everything that he stands for. Or I may not agree with anything that he stands for. But, by God, it's kinda neat to have a President living in your town.'" Trump's smooth relations with Bedminister owe much to Ed Russo, the self-styled (he has no formal training or degree) environmental expert for the Trump Organization who is an all-purpose fixer and consigliere. Russo grew up in Bedminster and later chaired the town planning board; he helped broker Trump's purchase of the land. Outside Bedminister, the combative style Trump has employed in the White House characterizes his dealings in golf. During a 2005 lawsuit with a construction company over disputed billings for work done at Trump's golf club in Westchester County, N.Y., his then lawyer Y. David Scharf offered this: "If you get caught with your hand in Mr. Trump's cookie jar, you're going to get slapped and slapped hard." Trump was ultimately awarded $2.1 million in damages, plus interest and legal fees. (He later sued Scharf's firm, Morrison Cohen LLP, for unauthorized use of his name and likeness on its website; the lawyers termed the suit "frivolous" and claimed it was a diversionary tactic as Trump was unwilling to pay an outstanding tab of $470,000. While a judge threw out Trump's complaint, the parties came to an undisclosed settlement.) In other legal skirmishes, the cookies have often gone to Trump's opponents. In February 2017 a federal judge ordered Trump Jupiter Ritz Carlton, in South Florida, to pay $5.77 million to a group of 65 disgruntled members. Trump had purchased the Jack Nicklaus–designed course in '12. In a letter to the members, he vowed to turn it into "one of the finest clubs anywhere in the world!" By the time Trump assumed control, 150 members were on a waiting list to resign from the club and claim their refundable deposits of $200,000. (This potential $30 million liability had been part of the terms of the sale.) As at many high-end clubs, a member's resignation at Jupiter isn't accepted until a new member joins. It could take years to clear the resignation list and in the interim the members were still being billed their monthly dues. But Trump barred them from the grounds, saying in an April deposition, "You're probably not going to be a very good club member, you're not going to be so happy." He then offered the wait-listers a deal: They could remain part of the club if they forfeited their deposit and in return they would receive three years of free dues (a total savings of at most $20,000, depending on the membership category). In the letter to members, he wrote: "If you choose to remain on the resignation list—you're out." In subsequent video testimony, Trump termed the threat "negotiation." The members wanted their money back, lawyered up and ultimately prevailed. Not all of Trump's golf-related legal skirmishes are battles between haves and have-mores. In February 2016, the Trump Organization sued five homeowners whose properties are adjacent to the Red Course at Trump Doral, in Miami. Russo told The Miami Herald that the middle-class homes were "in serious disrepair. And there are behaviors in people's backyards that are inconsistent with a world-class set of golf courses like Donald Trump is attempting to create." Russo told The Herald that the behavior included the playing of music, consumption of alcoholic beverages and the hanging of undergarments on a clothesline. Trump Doral's solution was to plant flowers, bushes and 20-foot palm trees, blocking the neighbors' long-standing views of the golf course (and the golfers' view of the neighbors). When resort personnel discovered that the plantings had been trimmed back and some of the palms denuded, the lawsuits were filed, with each homeowner being hit with $15,000 in damages. "We're not the bully," Russo told The Herald. "We're not going on their property and doing anything. We don't want to sue them. We just want them to stop." The lawsuit remains unresolved. A USA Today report in June 2016 identified more than 3,500 lawsuits over the last three decades to which the Trump Organization has been a party. In some corners of New York and South Florida, where Trump has spent most of his life, getting sued by him is routine: In July 2010 he slapped Palm Beach County Airport with a suit, claiming airplanes were being directed over Mar-A-Lago out of spite. "Ah well, he's sued me before," said Bruce Pelley, the airport director. Indeed, that was in 1995, with a similar lawsuit about noise over Mar-A-Lago. Trump dropped the suit after the county agreed to lease 215 acres to him. The county had previously balked at Trump's attempts to acquire the land, which became Trump International Golf Club West Palm Beach. His lawsuits often seem like bargaining ploys. "In examining the body of reporting on his golf properties, a theme quickly emerges," The Huffington Post reported. "With Trump, every spat—no matter how petty—turned into a war." The bucolic town of Palos Verdes, just south of Los Angeles, became one battleground. Trump bought the former Ocean Trails golf course out of bankruptcy in 2002, after three holes were damaged by a landslide. His purchases of distressed properties, whether at Doral or Ireland's Doonbeg or a 36-hole complex in Washington, D.C., have followed a pattern: Trump is hailed as a conquering hero who will add value to the community; he invests a substantial amount of money to improve the properties, and for a while everyone is happy; legal skirmishes ensue, with Trump using his seemingly limitless resources (and the press) to try to overwhelm the other side. At the rechristened Trump National Los Angeles, the eponymous owner wanted to develop 20 luxury homes, but Palos Verdes was insisting on rigorous environmental and safety studies because of the previous landslide. Trump sued the city for $100 million in '08. Other grievances he had with Palos Verdes included the city's refusal to rename Ocean Trails Drive to Trump National Drive and the removal of a row of 12-foot ficus trees that had been planted without a permit to block the view of a low-cost housing development at the edge of the property. In 2008 this same golf course birthed another lawsuit. Trump was sued for age discrimination by Lucy Messerschmidt, a hostess at the clubhouse restaurant. She alleged that under Trump's direction she had been dismissed in favor of younger, more fetching women, a charge that was backed up by sworn testimony from both the course's restaurant manager and the director of catering. Messerschmidt's lawsuit evolved into a class-action suit that ultimately involved 913 current and former employees of the club and came to include other labor violations including the denial of bathroom breaks and paid lunches. In '13, Trump paid $475,000 in a settlement. As for his concurrent battle with the city, in '11 a judge upheld Palos Verdes's environmental review process, but other parts of the lawsuit ground on. In '13 a new mayor and some fresh faces on the city council helped broker a peace, renaming the road to the course and offering an extension on the development agreement that governs the property. Trump withdrew the suit. 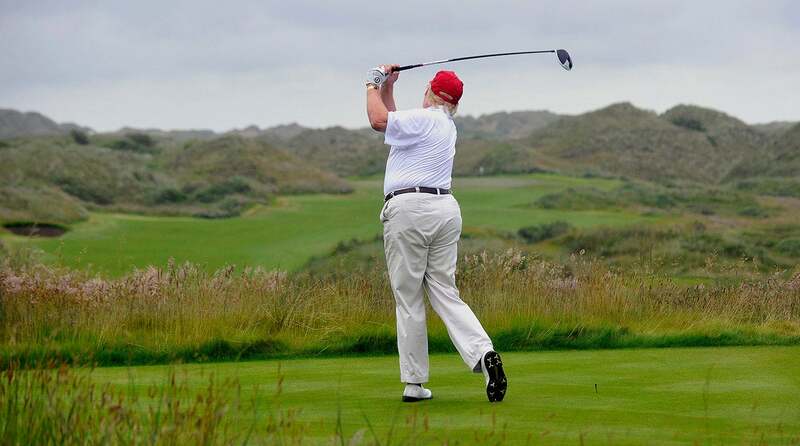 When it comes to reducing the property taxes on his golf courses, he has battled to the bitter end. In July 2015, Trump filed financial disclosures as part of his presidential bid in which he declared seven of his domestic golf courses to be worth at least $50 million each. But when it has been time to pay the tax man, Trump has sued more than a half-dozen -municipalities fighting for valuations that are a fraction of what he recently stated the courses to be worth. The crux of these lawsuits is a common municipal tax loophole based on "current use," in which appraisals are based on how much income a property is generating as is, not its intrinsic value. Trump bought Trump National Golf Club Westchester out of foreclosure in the mid-1990s for $8 million. He claims to have spent $45 million on improvements, including an opulent 75,000-square-foot clubhouse. (The downstroke to join the private club is $250,000.) Trump has also been approved to build 71 condominium units along the 9th fairway, in what is a highly regarded school district in Briarcliff Manor, a suburb north of New York City, and part of the town of Ossining. Westchester was one of the properties that Trump valued at more than $50 million in his disclosures. In 2008, during the economic downturn, Ossining slashed the taxable valuation of the club by 55%, to $13.5 million. (The Westchester Journal News reported that "Trump's legal team had pleaded for relief.") Yet in May '16, Trump sued the city to have the value of the club reduced to $1.4 million. If successful, his tax bill would plummet by a corresponding 90%. Trump's biggest savings would be in how much he pays in school taxes, with the local district receiving $32,000 instead of $287,000. In 2015, Trump told FORTUNE, "I feel golf should be an aspirational game. People should come to golf, golf shouldn't come to them. [That attitude] may be elitist, and perhaps that's what golf needs. Let golf be elitist. When I say ‘aspire,' that's a positive word. Let people work hard and aspire to someday be able to play golf. To afford to play it." His persistent litigation with the communities surrounding his luxurious properties has only widened the gulf between those who are in the club and those who are not. Ossining's receiver of taxes, Gloria Fried, spoke to this in summing up her town's ongoing dispute with the President: "He's going to pass the tax burden on to everybody else. And we still won't get to play on his golf course." Trump's overseas golf interests have added a layer of complication to Middle East politics. His closest business ties are with Saudia Arabia and the United Arab Emirates, two countries excluded from the administration's travel ban. His newest courses to open will be in the UAE, and his business partner there is Hussain Sajwani. A Shiite Muslim in a Sunni country, Sajwani has been a controversial figure in the UAE; he owns a large catering business that fed U.S. soldiers during both gulf wars as well as during conflicts in Bosnia, Somalia and Afghanistan. He transitioned into a real estate mogul through his company Damac Properties, which is building some 10,000 luxury housing units around both of the Trump golf courses in Dubai, which are among the largest developments in the country. Sajwani attended the President-elect's New Year's Eve party at Mar-a-Lago, and headlines were made when Trump hailed him from the stage. During a visit to Trump Dubai's shiny real estate sales center in February, a steady stream of Mercedes and Bentleys pulled up, carrying men and women in traditional attire. One employee agreed to speak on the agreement that neither his nor her name nor any identifying details would be used. "All day long there is talk about Trump and what his intentions are," the person said. "There is fear, for sure. We all wonder what his next order will be. But Dubai is a place obsessed with wealth and status. The Trump name has always been about wealth. Now he is President of the United States—nothing has greater status than that. Whatever their personal feelings may be about him, the buyers here don't want to miss out on the opportunity to align themselves with the Trump brand." The biggest name in golf is now linked to the President through the Trump World Golf Club Dubai, which is slated to open in 2018. "My father and Tiger have been friends for a long time," Eric Trump told GOLF.com in a '16 interview. "They've been very, very close. When you combine Trump and Tiger, it's a match made in heaven." But in a statement to GOLF.com, Woods's spokesman Glenn Greenspan wrote: "Tiger is not in partnership with Mr. Trump or his organization and stating otherwise is absolutely wrong. Tiger Woods Design's contract and obligation is to the developer, Damac Properties. Our association ends there. I can't put it any clearer than Tiger Woods Design does not have an agreement with Mr. Trump." Who is and isn't doing business with Trump has become a hot-button issue throughout the Middle East. Last month Saudi Arabia, the UAE and Arab allies broke off diplomatic relations and began a blockade on trade and travel with Qatar, claiming it was punishment for the country's support of terrorism. Trump was immediately critical of Qatar, and in analyzing his aggressive stance siding with Saudi Arabia and the UAE, home countries of 17 of the 19 Sept. 11 terrorists, media in the Middle East and elsewhere noted that the President has no business ties to Qatar. He had traveled to Qatar in 2010 trying to raise capital for a real estate fund but was rebuffed by Sheikh Hamad bin Jassim al-Thani, who was then serving as Qatar's foreign minister and prime minister. Brian Egan, a state department legal adviser during the Obama Administration, recently told The New York Times, "Other countries in the Middle East see what is happening and may think, We should be opening golf courses. Even if there is no nefarious intent on behalf of the President or the Trumps, for a president to be making money from business holdings in sensitive places around the world is likely to have an impact." How else, will golf influence the 45th President of the United States? Trump Lido in Indonesia is scheduled to open next year, giving him a stake in a politically unstable country of 258 million. A Wall Street banker and member of a Trump club with knowledge of the financing of the $63 million Turnberry purchase expects the deal to be a subject of interest to special prosecutor Robert Mueller, given the foreign lenders he says were involved. In July 2016, Bloomberg BusinessWeek reported that top executives in the Trump Organization made many visits to Cuba in the preceding four years, despite the U.S. embargo on Americans' conducting business there. (Last month, Trump tightened restrictions on commerce and travel between the two nations.) Cuba has only one 18-hole golf course but thousands of miles of undeveloped coast. Russo says he has made a dozen trips to Cuba since '11 but says they were of a personal nature, including bird-watching with Larry Glick, the Trump Organization's executive vice president for strategic development. The President has famously dismissed climate change as a hoax perpetrated by the Chinese while also calling it "pseudoscience" and "total bull----." But citing the rapid erosion of its dunes and ocean frontage, Trump International Golf Links & Hotel Ireland petitioned County Clare in May 2016 to build a two-mile, 200,000-ton seawall that would be as high as 15 feet on the picturesque, crescent-shaped Doughmore beach. The permit application stated, "Predicted sea level rise and more frequent storm events will increase the rate of erosion throughout the 21st century." The application expired when the Trump Organization failed to complete the paperwork, but the company is putting together a new proposal with two smaller seawalls. (Meanwhile, the Scottish Environment Protection Agency has objected to the Trump Organization's plans to build a second course in Aberdeen, named after Mary MacLeod, citing environmental concerns.) The threat to his seaside golf courses—including the two existing ones in Scotland—may yet influence Trump's thinking about climate change. For all the questions and complications that come with the President's golf empire, he still finds respite on the course and at his properties. Shortly after the presidential motorcade had left the U.S. Women's Open, Eric Trump told SI that his father "was so relaxed, he was having so much fun. It was nice for him to be outside of Washington, D.C." And yet for the President, politics and golf are now inextricably linked. During the Open, one of the few players to enjoy an audience with him was Sandra Gal, a member of the European Solheim Cup team from Germany. He quizzed her about the speed of the greens, thickness of the rough and other details about how his course was playing. "I asked him how he was doing," Gal says, "and he said, ‘This Russia stuff is nasty business. Much nastier than trying to make a three-foot putt.'"